PROBABLY one of the toughest weeks to choose sides imo and I’m still unsure. No value in teams like Green Bay, Rams or Seattle, but it's teams like Denver, Carolina and Atlanta that intrigue me most. Denver's tough defence against a QB in his first NFL start. The Bengals tightened up their run D against the bruising Nick Chubb last week, but Lindsay is a very different back and has shown impressive skills this season. I’m taking his rush and receiving yards with confidence in a game that's likely to see 14mph+ winds. My lean Carolina is also because of potential weather with high winds and rain expected in Tampa. Fingers crossed no thunderstorms which would likely stop play, but Carolina should have won last week and will be looking to snap a 3 game losing streak. No matter which QB the Buccs field, they will likely cough up the ball, and with Cam now finding playmakers throughout his offence outside of Olsen and McCaffery, the Panthers should win, but a division game on the road is usually a grind. Final lean being Atlanta is based on not being as impressed with Lamar Jackson as his two game win streak shows. If The Raiders offense wasn’t so inept, they might have struggled to beat Oakland if it wasn’t for the Ravens' defensive TD in garbage time. Jackson threw two picks in that game, and with Jones returning for Atlanta on D, there’s probably no better linebacker than he to spy Jackson. Both of Jackson's wins have come at home too, so it will be interesting to see if he can handle the crowd if they get behind. They’ve been lucky enough to have not been trailing for too long over Jackson's two starts, so if Atlanta can eek out a lead, they could easily test Jackson's arm. For my two cents I’d advise caution on betting in Green Bay with temperatures hovering around 0 with 22pmh winds. Your dead on about the value mate but you’ve perked me up already with an early prop play! I do feel there are some hidden gems this week. Panthers need to win and know it’ll be lighting up the Bucs on O is the way to go so 54 to beat the total is very achievable. Texans are looking pretty unstoppable in all phases of the game and I feel the Browns aren’t at the same level but their recent run has helped us here with the price as I feel the Texans are just better and at home. 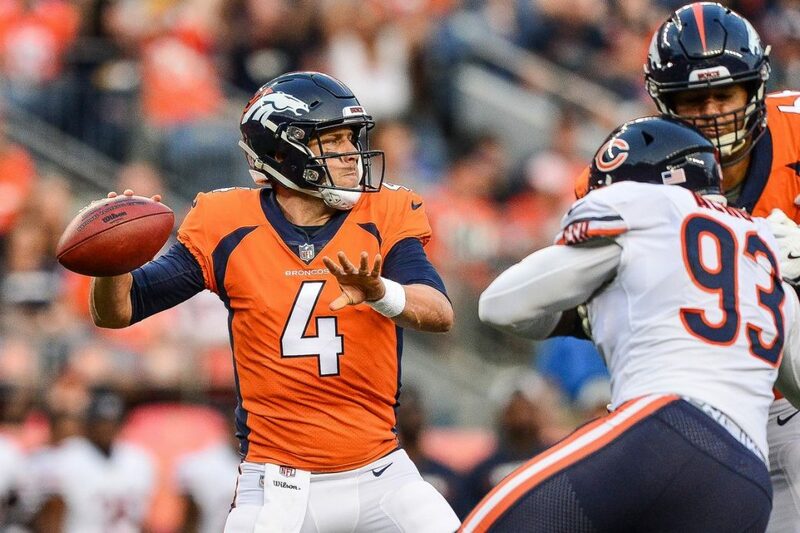 Broncos are improving on O week by week and we seen what Keenum can do with momentum behind him last season @ the Vikes so I don’t see a slip up against a Bengals team who’ve gave up. Just look at their IR and you can see these are teams going in opposite directions. Finally I’m going against my Vikes as the Pats need this as much as we do but Foxborough is just too tough a place especially if Rhodes & Diggs aren’t 100%. 365 offers -3.5. I’m going for -4 here pretty easy explanation, worst offensive line in the league vs one of the best if not the best in Mack. Eli prone to turnovers this Bears secondary has the highest takeaways in the league by a long shot. Big mismatch here for me personally. Great Lindsey prop mate. Covered my betting so cheers. Again though. Favourites losing or struggling to cover their spread. Tough times in the NFL. Does McCarthy see out the season? Then who gets it when he goes? McDaniels with Rodgers must appeal. Altoough I read somewhere they’re saying this might be the season Harbaugh & Ravens part company, which would be an interesting appointment. Do you see this one going over on the total? 52.5 at the moment. Not sure on that but two high powered pass offence . Think chargers will miss m Gordon tho . Expect a good reaction from the steelers after last week loss to the broncos . @jawan biggest bet in a long time. Make of that what you will but bet what you can afford to lose. Steelers lose a 16 point half time home advantage for the first time . Its a tough slate on Sunday with two picks from AFC teams looking to solidify their chances of the playoffs. The Patriots will head down to Miami where they’ve struggled in seasons passed (1 win in 5). Im fact, the home team has won 11 of the last 12 matchups. That weather in Miami is clearly a factor when New England travel, but the defensive looked strong last week against Minnesota, so it will be interesting to see how Tannehill fairs. He struggled mightily last week against Buffalo and was helped by penalties late in the game to secure the winning TD. Brady > Tannehill, give me TB12. Second pick sees the Chargers fresh off their big win in Pittsburgh at home to the Bengals who are done for the season with Dalton and Green on IR. Jeff Driskel was sacked four times and threw a pick against Denver at home last week, and will face another elite pass rush today in Bosa and Ingram. As you know I tipped the Chargers to win their division and make the playoffs this year, and it wasn’t for Patrick Mahomes I’d be sitting pretty. Still think they can get an easy win without Melvin Gordon and I may look to see what rookie Justin Jacksons line is when released. He is averaging 8 yards per carry over their last two games and should see a bigger role after strong efforts.